Solidly built double-column construction, a high-speed spindle and intelligent technologies, give this CNC machine the ability to easily cut a variety of exotic metals. Okuma America Corporation announces the debut of the new 5-axis, GENOS M460V-5AX vertical machining center, combining a full 5-axis simultaneous control with rigid, cast iron, double-column construction and a high-speed spindle. These features give this CNC machine the ability to easily cut a variety of complex parts and exotic metals with speed and precision. The GENOS M460V-5AX delivers machining excellence through a small machine footprint, rapid feed rates, precise cutting and smooth surface finishes. 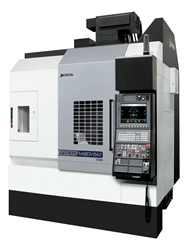 For more information on Okuma’s newest 5-axis VMC visit https://www.okuma.com/genos-m460v-5ax-1. Okuma America Corporation is the U.S.-based sales and service affiliate of Okuma Corporation, a world leader in CNC (computer numeric control) machine tools, founded in 1898 in Nagoya, Japan. The company is the industry’s only single-source provider, with the CNC machine, drive, motors, encoders, and spindle all manufactured by Okuma. The company also designs its own CNC controls to integrate seamlessly with each machine tool’s functionality. In 2014 Okuma launched the Okuma App Store, the industry’s only centralized online marketplace for machine tool apps and related content. Along with its extensive distribution network (largest in the Americas), and Partners in THINC, Okuma is committed to helping users gain competitive advantage through the open possibilities of machine tools, today and into the future. For more information, visit http://www.okuma.com/americas or follow us on https://www.facebook.com/OkumaAmericaCorporation or Twitter @OkumaAmerica.